SUPERIOR QUALITY STANDARDS: Our Dandelion Root is carefully tested and produced to superior quality standards. TRADITIONAL HEALTH REMEDY: Dandelion Root is a popular bitter herb used for centuries as a traditional health remedy. NON-GMO PROJECT VERIFIED: We’re proud partners with The Non-GMO Project. In keeping with our mission to follow the best sourcing, manufacturing and testing practices, we’re committed to providing only non-GMO products. 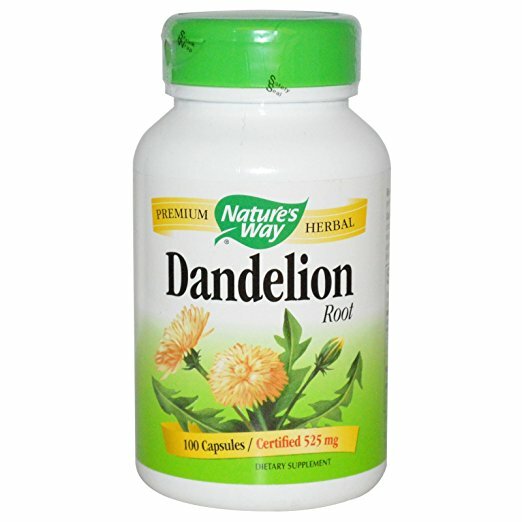 Nature’s Way Dandelion Root is produced according to the best practices for GMO avoidance. GLUTEN-FREE AND VEGETARIAN: Our Dandelion Root is gluten free and vegetarian, made from plant-derived capsules. It also contains no sugar, salt, yeast, wheat, soy, corn, dairy products, artificial colors, flavors or preservatives. SERVING RECOMMEDATION: Take 3 capsules once daily. Caution: If pregnant, nursing, taking any medications, or if you have any gastrointestinal disease, consult a healthcare professional before use. Do not use if you have gallstones, if intestinal obstruction or inflammation is present, or if you have allergies to Asteraceae (Compositae) family.